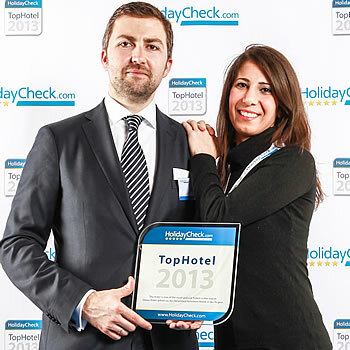 The award of the title "HolidayCheck TopHotel2013" is a great honor for us. Our special thanks to our guests who have brought much trouble in the past with their experiences, such good reviews for our hotel in Sarti Maistrali truthful in words and pictures on paper. Our thanks also go to our friendly team who always provide with diligence to the ambience of well-being. 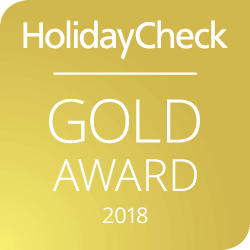 For the offer to bring verifiable reviews on the website of HolidayCheck also a thank you to the operators of HolidayCheck for this great award. Never believe to have reached the top - for such the way down and have to start again in November renovated our rooms - have become great! The great recognition of our guests inspired our motivation is always to make your stay enjoyable and memorable. 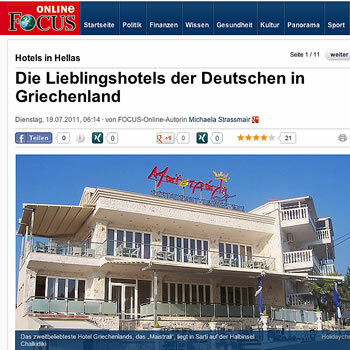 Focus Online has chosen the favorite hotels of the Germans in Greece in 2011. In almost all of the 99 reviews is talk of the "great view of the small town, the beautiful bay and Mount Athos" ("Bettina"). User "Thomas" feels "immediately after the arrival of a fiddle." Of course, he is also entranced by the panorama, but also of "the very nice family who run this hotel are lovingly." The owners speak German, which makes the relationship with their German guests even more intimate. "Bettina" is also thrilled by the service: "Just great, no matter what you want, there is an almost everything satisfied."